As the Army of the Potomac and Army of Northern Virginia grappled for control of the Mule Shoe Salient at Spotsylvania, another battle took shape on the outskirts of Richmond. During the Federal march out of the Wilderness, the tumultuous relationship between Maj. Gen. George Meade, the Union army commander, and his cavalry chief Maj. Gen. Philip Sheridan erupted in a fiery confrontation. At the end of the heated exchange, Sheridan boasted that he could whip the Confederate cavalry under James Ewell Brown “Jeb” Stuart. Rather than censure Sheridan, Lt. Gen.Ulysses S. Grant authorized him to take his entire corps south and engage their gray counterparts. On May 11, Sheridan’s troopers mortally wounded Stuart at the Battle of Yellow Tavern. He died the next day in Richmond. Before he continued to the James River, Sheridan decided to skirt the outer and intermediate defenses of the Confederate capitol. Sheridan’s route took his men south to Brook Church, just inside the city defenses, and then on toward a crossing of the Chickahominy River known as Meadow Bridge. Unbeknownst to Sheridan, the Confederate cavalry had regrouped after Yellow Tavern and were waiting for him. 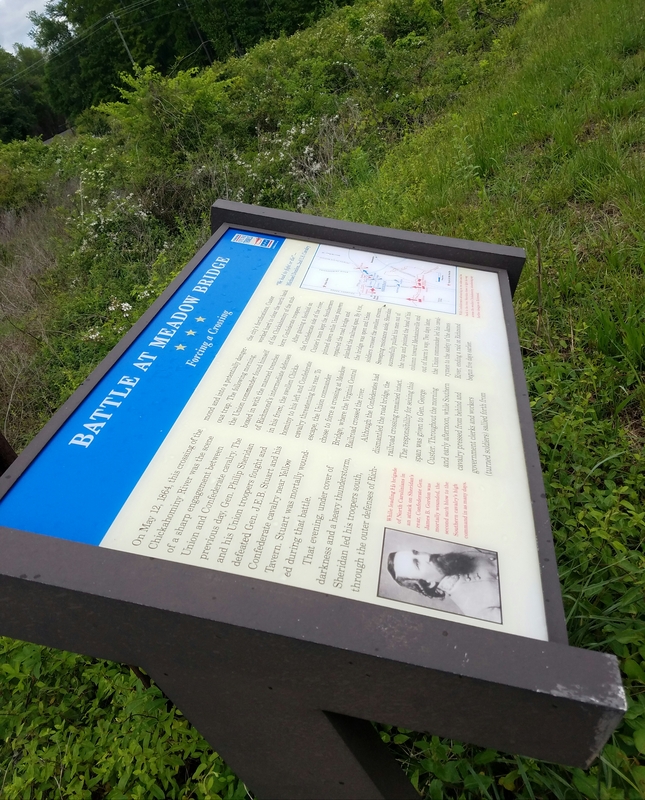 Maj. Gen. Fitzhugh Lee had rallied his men and positioned them on high ground beyond Meadow Bridge. Lee hoped to snare Sheridan between the defenses to the north and south and his troopers in the east. Brig. Gen. James Gordon’s North Carolina brigade would close off any westward escape. Shortly after 3 a.m. on the morning of May 12, Sheridan’s troopers rode into the trap. Brig. Gen. James Wilson’s division led the Union advance. Misled by a guide dressed in a blue cavalry overcoat, Wilson ran head long into the defenses, bringing the march to a grinding halt. Dawn revealed Sheridan’s dilemma. Confederate infantry as well as local defense troops had materialized in the Richmond defenses. Lee’s troopers were ensconced behind makeshift log and rail barricades on a ridge beyond the Chickahmoniny. To his rear, Brig. Gen. David Gregg’s division had begun to exchange fire with Gordon’s Tarheels. Sheridan deduced that his only way out was to push across Meadow Bridge and engage Lee. For this assignment, Sheridan turned to Brig. Gen. George Custer’s brigade from Brig. Gen. Wesley Merritt’s division. Custer faced a daunting task. Before him lay a bridge which connected the two banks of the Chickahominy. The Confederates had removed the flooring and it would have to be rebuilt for the cavalry to cross. To protect the men who had to replace the boards, Custer decided to send skirmishers across to the opposite side by using an adjacent bridge that serviced the Virginia Central Railroad. Covered by sharpshooters, men from the 5th Michigan Cavalry moved through the river and atop the railroad bridge. Joined by their comrades in the 6th Michigan, Custer’s troopers managed to establish a temporary position on the far shore and occupy the Confederates. Custer’s men then went about patching together new flooring by tearing down nearby fences and buildings. The situation grew tense as enemy reinforcements arrived. Through course of the morning and into the early afternoon, Wilson and Gregg repulsed attacks by infantry brigades under Cols. Eppa Hunton and Archibald Gracie. By 4 p.m., Custer’s bridge was ready and Sheridan ordered Merritt to send additional regiments to reinforce the 5th and 6th Michigan. The troopers then commenced an assault on Lee’s line. A trooper from the 9th New York remembered the “extended line…to the right and left soon has a cross fire on the enemy’s position and he was driven out.” The Confederates stubbornly fell back to a reserve line. Merritt then called upon the 1st New York Dragoons from Col. Alfred Gibbs’ brigade to punch through Lee’s position and open the escape route. Dismounted, the Dragoons launched their assault. Rushing ahead, the Dragoons opened fire with their Spencer carbines and “made a perfect hailstorm of leaden bullets” a New Yorker recalled. “It was one of the prettiest sights I saw while in the service, as well as one of the most exciting.” Lee’s line gave way and the escape route opened. Sheridan’s march continued to the old battlefield at Gaines Mill and then to White Oak Swamp. On May 14, two days after the battle, he made contact with Union gunboats on the James River below Malvern Hill. Going into camp around Haxall’s Landing, his exhausted troopers enjoyed a well deserved rest. Fortunately, thanks to the efforts of his subordinates, Sheridan’s reckless and rash decision to enter the Richmond defenses did not destroy the cavalry corps. As Grant and Lee continued to slug away at each other and the armies drifted farther to the south, it would not be long until Sheridan launched another raid into central Virginia. This time, he would be stopped cold at a place known as Trevilian’s Station. This entry was posted in Armies, Battlefields & Historic Places, Battles, Campaigns, Cavalry, Common Soldier, Leadership--Confederate, Leadership--Federal, Memory, Personalities and tagged 1st New York Dragoons, 5th Michigan Cavalry, 6th Michigan Cavalry, 9th New York Cavalry, Alfred Gibbs, Archibald Grace, Battle of Spotsylvania, Battle of Yellow Tavern, David M. Gregg, Eppa Hunton, Fitzhugh Lee, George Custer, George Meade, James Gordon, James Wilson, JEB Stuart, Mule Shoe Salient, Philip Sheridan, The Battle of Meadow Bridge, The Michigan Brigade, Ulysses S. Grant. Bookmark the permalink. Great description. I could almost picture myself there watching the battle.